With GEOS Languages Plus you’ll get an excellent education and an amazing experience abroad. Our classes and programs are optimized by making use of the latest ESL materials and teaching methods so you’re sure to learn fast. Your classes will be taught by experienced teachers who can help you achieve your goals and continue to College or University with our Pathways Program! Students from around the world come to GEOS for affordable courses and programs. We also offer after-class activities and excursions that will help you discover your new city and practice your English abilities. We have exceptional English schools in New York and Los Angeles. NYC is often revered as the art & film center of the world. Coming to NYC means studying English and learning American culture the New York way! 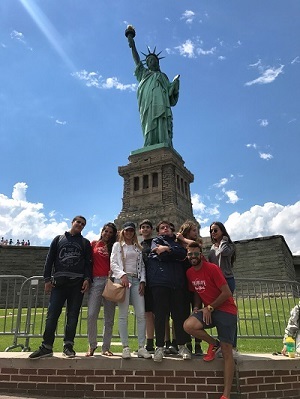 Located right in the heart of the Financial District and a stone's throw away from Battery Park, our school boasts a stunning view of the Statue of Liberty and Ellis Island. The nearest subway is a mere 5 minutes away on foot. GEOS New York ESL School offers programs that will help you to learn English conversation, prepare for an ESL test or improve your English for work or university. Our IELTS classes have great teachers who are kind, but have high standards and will give you the right amount of push to succeed. English language programs with GEOS can be the first step to a degree or a great career. Our guests in New York are presented with the choice of staying in a single or twin bedded room at our residence conveniently located near to our school location, or at one of our multicultural homestays. Either choose from Full Board (3 meals a day) or Half Board (2 meals a day) meal options. Los Angeles combines climatic brilliance with gorgeous attractions. The city provides easy access to many of the major California attractions, such as beaches, mountain areas, Disneyland, Six Flags Magic Mountain and Palm Springs. Besides its notable shopping centers, Los Angeles is also known for its diverse art galleries and art-oriented events which take place on Hermosa- and Malibu Beach. The school is located in an attractive suburban neighborhood, about 30 minutes away from downtown Los Angeles. While studying with us you will be accommodated in one of our homestays in a basic furnished single or double room or together with other students in our college. Homestays are generally located 45-60 minutes away from the school using public transport. At GEOS Language Plus, students benefit from variety in their daily classes. They are able to practice all of the English language skills because they get three different classes every day. Each class is taught by a different teacher. Besides that, GEOS Language Plus guarantees that you will receive extra time of English speaking, more than in a regular class in any other school because every day, students take a 90-minute speaking and listening block.